1. Mix the carrots, onion, mint and yogurt together in a bowl. Dry fry the cumin seeds for 1 minute until lightly toasted and stir into the carrot coleslaw. Season to taste. 2. 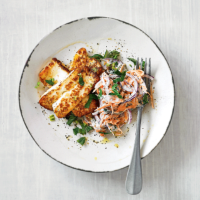 In the same pan, heat the oil and fry the halloumi slices for 2 minutes each side until golden. Serve alongside the coleslaw. Garnish with extra mint and freshly ground black pepper.